Hero Histories: It's Crime Time at Christmas Time! What do we at Atomic Kommie Comics™ think of? 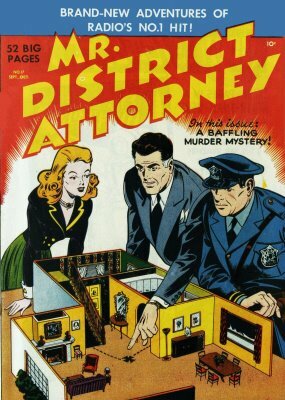 For a subject-specific gift for the lawyer, or other legal professional in your life, the crew at Atomic Kommie Comics™ suggests you have a look at the Daring District Attorneys and other Legal Eagles section of our Crime & Punishment™ collection, featuring the long-running radio/tv character Mr. District Attorney! Inspired by the racket-busting exploits of New York City DA Thomas E. Dewey (who later became New York's Governor), law student-turned radio writer Ed Byron created a nameless "everyman" DA who maintained law and order in an unnamed Big City (implied to be NYC). The stories, while rarely based on actual cases (like rival show GangBusters) followed actual legal procedures to the letter, even introducing CSI-style "lab boys" to analyze evidence and present testimony during courtroom sequences! Though several actors played Mr. District Attorney, the DA's secretary, Edith Miller, was played by the same actress, Vicki Vola, for the entire run of the show both on radio and tv (1939-1953)! There were also several b-movies, which took the name, but little else, from the radio series. The comic book series, from which we draw our imagery, was packaged by the Bob Kane comic book studio. Bob Kane was the co-creator (with Bill Finger) of the most famous fictional detective of the 20th and 21st Century--The Batman! We offer five different classic comic book crime-busting covers as well as his distinctive logo on items ranging from mugs to mousepads to t-shirts, as well as a kool 2011 12-Month Calendar! And, if attorneys aren't your thing, the Crime & Punishment™ collection also has Movie Spies & Secret Agents, Newspapermen (& Women) Against Crime, Real Life Criminals, Police--the REAL Heroes!, Sherlock Holmes, Top Secret--Images without Words, All-True Detective Cases, Crimes by Women, Gangsters, Private Dicks, and G-Men T-Men & Spies! Use them responsibly this Yuletide season, citizens! BONUS: A FREE Christmas present, to you, our faithful readers: mp3s of the Mr District Attorney radio show!